How popular is the baby name Dardenella in the United States right now? How popular was it historically? Find out using the graph below! Plus, check out all the blog posts that mention the name Dardenella. There’ll be one girl in my harem when you’re mine. We’ll build a tent, just like the children of the Orient. Oh, sweet Dardanella, my star of love divine. 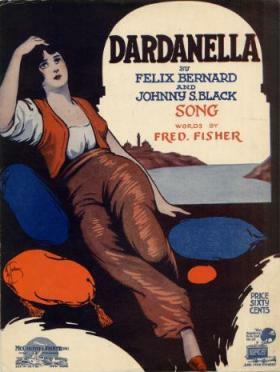 In fact, Dardanella was the top debut name for baby girls in 1920. The spelling variant Dardenella also appeared for the first and only time on the list that year. The name in the song is derived from the word Dardanelles, which is one of the Turkish Straits that separates European Turkey from Asian Turkey. The word Dardanelles can be traced back to the mythological figure Dardanus, son of Zeus and Electra. What do you think of the name Dardanella? Usable nowadays? Source: “From ‘Dardanella’ On A Stroh To Stacked Tapes.” New York Times 13 Dec. 1964: 24.